Karen Bannan from B2B Magazine posted this interview she had with me on how email can be effective to drive people to Webinars. Email marketing can be a smart way to help people learn more about your company or brand, and email marketing is one of the best ways to get the message out about an event. Here are some promotion dos and don’ts you can put to work for your business. 1) Don’t forget the basics. It might sound silly, but marketers often forget the most salient information when sending out a promotional e-mail, such as date, time or program name, Popick said. Identify the time zone, for example, and include opt-out—and opt-in—links. In addition, make sure there’s a link that recipients can click on to preregister for the program. 3) Don’t be shy about reminders. If someone has signed up for your program, remind them a week before and then again the day before. It won’t seem intrusive if you keep it basic, including a link to the program, the time and day reminder, and a quick synopsis of what the recipient should expect. “The message can be changed up a bit, but the bullet points should probably stay the same,” Popick said. 5) Don’t overlook the power of testimonials. You probably use case studies and customer quotes in traditional e-mail marketing. It can work just as well in webinar promotions. 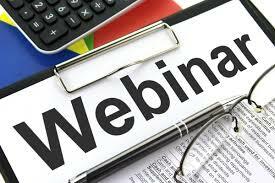 You can include links to previous webinars in your current invitation and call out the benefits of attending one of your events by letting a recent attendee explain what he or she got out of the experience, Popick said. 6) Do cull webinar transcripts and materials for future e-mail content. During a successful webinar you may receive more questions than you have time to answer. Those questions can be repurposed as e-newsletter content or blog fodder, Popick said. “You can include a sentence in the follow-up e-mail that says, ‘If you didn’t get your question answered, check out our blog,’ ” she said. You can excerpt one or two so registrants who didn’t attend have another reason to click through to the recorded webinar. 7) Don’t oversell yourself. Webinars work best when they are used for thought leadership and education; you don’t want your entire program to be too self-promotional. Don’t be afraid to tap speakers from outside your company, Popick said. “You want your speaker to be viewed as a best practice guru within your industry,” she said. What is your experience with email marketing to drive traffic to webinars?